The cool spot below Greenland is now average. 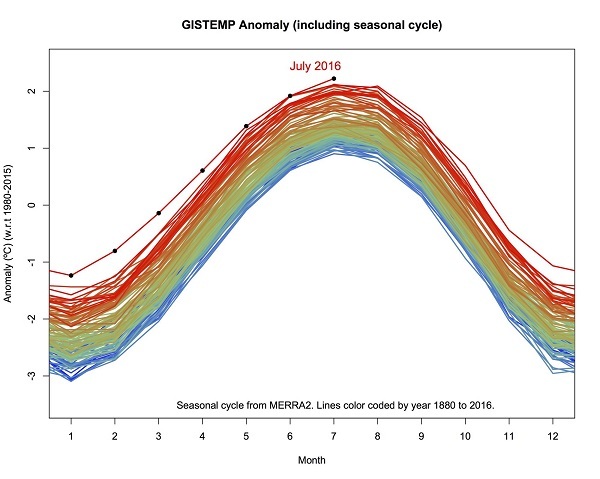 he expects July will be the last record hot month of this year as the residual heat from an exceptionally strong El Niño dies away. 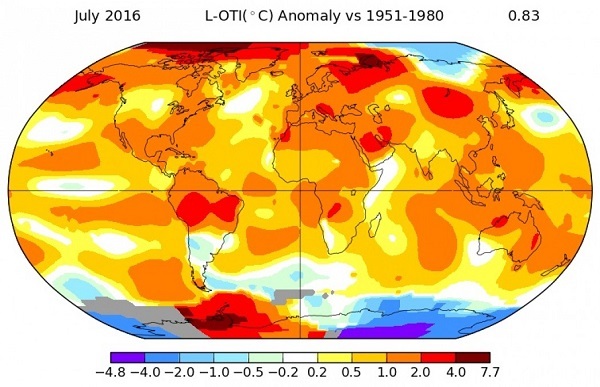 Though El Niño itself was declared over in June, global temperatures tend to lag by about two to three months. 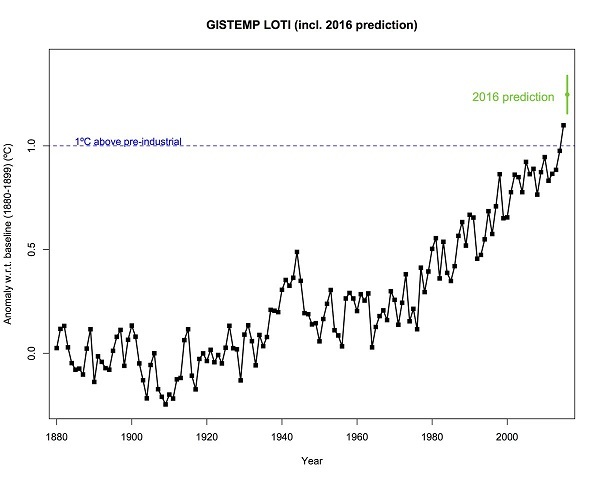 Malcolm Roberts on Q&A, as you probably know, told astrophysicist Brian Cox that he wasn’t impressed with graphs like that. The data has been corrupted by conspiratorial scientists, he says, thousands of them, working to a song sheet developed by shadowy powerful people trying to manipulate us into a world government. Such propositions don’t pass the common sense test. 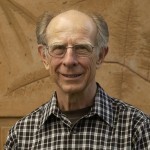 [Professor] Richard Muller, a former prominent sceptic US scientist, re-examined 14 million temperature observations from 44,455 sites across the world going back to 1753. The results prompted a “total turnaround” in his views. This is a reference to the large Berkeley Earth Surface Temperature project (BEST) back in 2011, which sceptic Anthony Watts said he would accept while the project was underway. However, it came up with the ‘wrong’ answers, so he didn’t. We are in the middle of the next big shift right now. 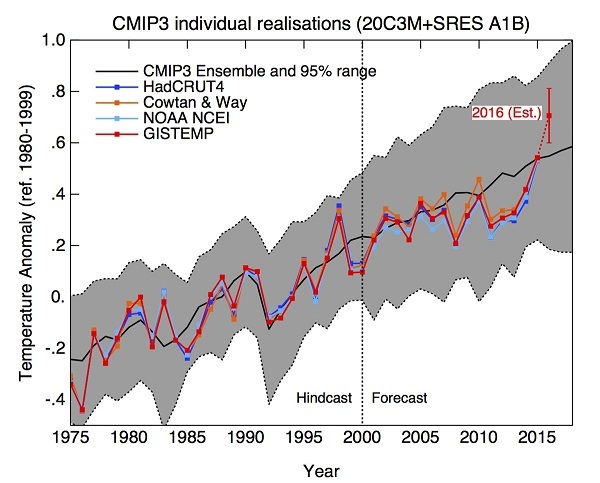 As this El Niño settles back into a more normal pattern we will find the shallow oceans and atmosphere are appreciably warmer than they were between 1997 and 2014. Things might be stable for a few years, who knows?, but another one will be on the way somewhere down the track. 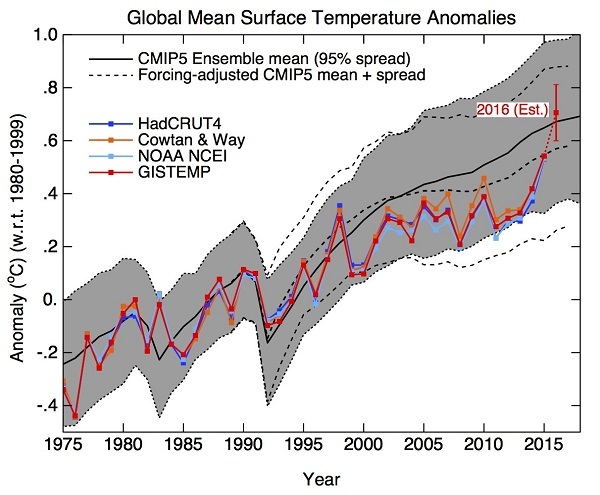 Previous step changes were 1968-70 southern hemisphere, 1979-80 global, 1987-88 northern hemisphere and 1997-98 global. Whether you take the stairs or the elevator, temperatures are still going up. I think Jones’ concentration on the change-up points should be a prelude to examining how the mechanisms of heat transfer on a large scale between the ocean and the atmosphere and surface temperature work, with patterned but essentially chaotic systems at play. The step change hypothesis in not a trivial matter. 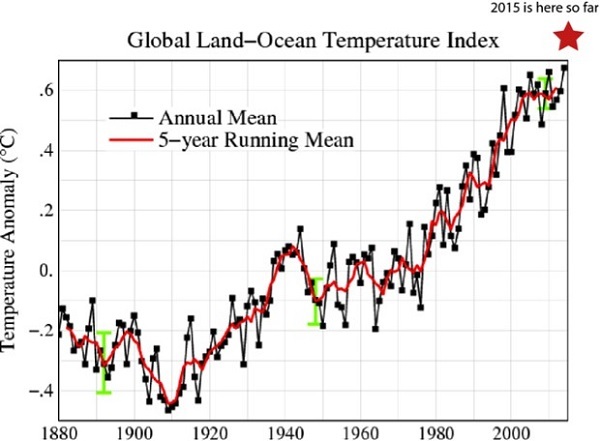 This view of the climate implies greater risk, and until we understand better what is going on, greater uncertainty. Not bad, generally speaking, but the forecast shows an elevator, whereas we seem to be on the stairs. 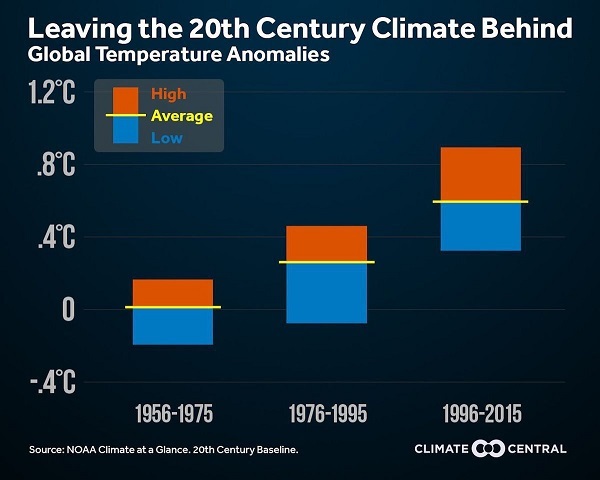 Dana Nuccitelli reminds us that climate change occurs over long periods – from the carbon pollution we’ve already put into the atmosphere, we’re committed to 1.5–3°C warming over the coming decades and centuries. Curt Stager’s Deep Future: The Next 100,000 Years of Life on Earth published by Scribe back in 2011 says the optimistic scenario is that it would take 100,000 years for the planet to return to ‘normal’ if we get CO2 under control quickly. only eight cities in the Northern Hemisphere — outside of Western Europe — will have a cool enough climate to host the summer games. No cities in Latin America or Africa would be viable hosts for the games, and only three North American cities — Calgary, Vancouver, and San Francisco — would qualify. Host cities for the Winter Olympics have already faced issues related to warming weather. In 2014, temperatures in Sochi reached 68 degrees Fahrenheit, making it the warmest winter games in history. In 2010, organizers at the Vancouver games had to bring in snow, airlifting it by helicopter and hauling it in by the truckload to ensure that there was enough powder to keep the games running. A step change would be worrying (though with Pinatubo, Krakatoa, Mt St Helens etc. not unprecedented and not unlikely). The system has parts with nonlinear behaviour and vastly differing response times to changes in other parts. Best of luck, to all of my fellow sentient creatures. And a special round of applause to the cyanobacteria. Ambigulous, you mean cyanobacteria, a phylum of bacteria that obtain their energy through photosynthesis. Ancient relic life form, base of food chain in rivers, lakes, top layer of seas. Apparently they give damp soil that “soil odour” that we all grow up recognising. Down here in Victoria some species have a poor reputation as the ‘blue-green algae’ that can make river or lake water unpotable for humans and farm animals. Fish kills? slowly raised the oxygen content of Earth’s atmosphere over aeons, and so without their preparatory efforts (seen from a human standpoint) this blog would never have appeared. The species causing concern in Gippsland Lakes have limiting nutrients P and N, so farm fertiliser runoff is a factor, but Nodularia can in extremis grab atmospheric N for itself, though that process uses excess energy.